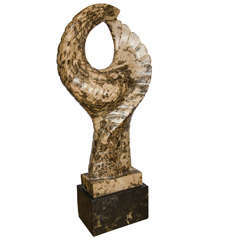 Sculpture dimension: Diameter 60cm. Materials used white marble from Carrara, oakwood, aluminium, carbon fibre. The wheel, in continues movement evolves in its appearance and in its material, but surely can’t escape from the law of gravity, this way remaining faithful to the round shape since the days of stone age. A Kinetic and sensory experience to relive the wheel in human history. 'La Ruota' was shown at Palazzo Ducale in Lucca/Toscany from 5th-30th of september 2013. 90 artists present their version of the wheel – the bicycle – used in sports, antagonistic sports, tourism and as part of urban mobility. Exhibition runs contemporary to the world cycling championship in Florence 2013, 22nd – 29th of September, leading from Lucca to Florence. The Atelier Barberini & Gunnell was founded in Ancona (Italy) by the architects and designers Francesco Barberini and Nina A. Gunnell as the result of a passion followed for a long period of time, creating objects far from the industrial reality; one-off pieces and limited editions. The choice of the best and most precious materials, the maniacal cure for detail are the basis of their modus operandi aiming to create timeless pieces. Every artwork has it’s inspirational background, it’s story. Gigantic spiders as tables which bypass the forests of enormous mangrove trees, light weighted and at the same time heavy glass Origamis, chained up tables which seem to revolt against the immobility of the four legs, freeing themselves in a movement of rings forming a chain. Abandoning the mere functionality and rediscovering emotions; from the warm perfume of wood, losing oneself in the transparent magic of crystal glass, to the cold and sterile steel, thought by mankind for mankind, mirror polished symbol of progress. The artworks by Barberini & Gunnell can be found in auction houses like Sotheby's, Bonhams, Tajan and Dorotheum and are presented by Italian and International galleries. The sculptural dining-table 'Chained Up Miami' was presented by the Ammann Gallery during ArtBasel Design/Miami 2016. Barberini & Gunnell also create for private clients and collectors such as the architect Peter Marino, who inserted a bench of the 'Get Lost!' family in his late. 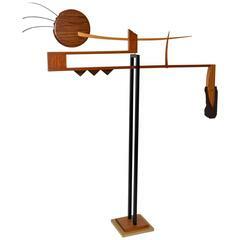 Large-scale, kinetic, highly stylized abstract sculpture of bird in mixed wood and stone. Mimics dipping bird on central pivot. Dated 1992. Maker's cipher.